G’day from the fantastic mountains in North Carolina. My name is Jez and I have been a part of the Paddling Program for many years and often am referred to as the Director of Vibe, I try to bring just a little bit of vibe to camp everyday. Let’s face it, everyone needs a pinch of vibe. I wanted to take this opportunity to bring you into our program and let you know what we have been up to. Already we are taking trips all over, the adventure program here at camp is second to none. Climbing on world class routes, camping in Pisgah wilderness, mountain biking on some of the trails that are constantly rated high in outdoor magazines, and the paddling here is some of the most amazing whitewater you can find anywhere. This past week kids have dove head first into the program and kids are on the water working on their skills. Continually we have three to four different paddling trips per day which makes this one of the biggest programs in the Southeast. Let me take you through our program. Kids start on the lake practicing their skills and learning the paddling strokes in an open boat before attempting the Buoy course which they need to complete in under 2 minutes. We are proud to have both an open boat and closed boat program here at Falling Creek, keeping a great mix of tradition and new school ways together while also learning to work together with a partner on the water. 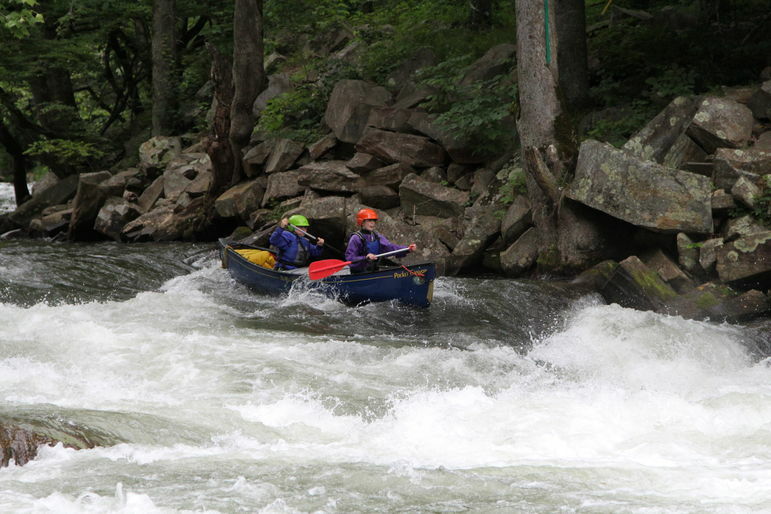 After completion of this they then can move onto the Tuck/Nanty river trip which is a two day trip on the Tuckaseegee river and Nantahala river, progressively moving up in the difficulty through to class 2-3 whitewater. If they successfully complete these rivers and catch the well-known “Truck Stop” eddy just above the mighty Nantahala Falls then campers can move into a Kayak and they gain their ‘Yaklet’ a wristband that signifies they have moved up to a whitewater kayak level. 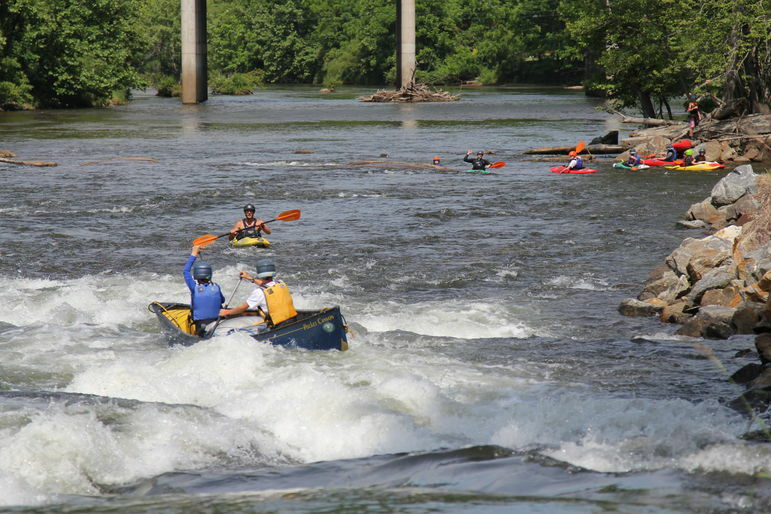 Here they start the progression again but this time in a closed boat and work on their roll to finally move towards some bigger and spectacular whitewater such as the Pigeon and Ocoee Rivers. This area is just amazing, I travel from Australia every year to teach, instruct and paddle on these rivers as the features and waterfalls are so spectacular. The recent World Championships of Freestyle Kayaking was held on the Nantahala river just last year and we are so fortunate to be able to paddle this and other close rivers daily. Paddling is one of our premier programs here at camp as kids who have learned how to kayak at Falling Creek have gone on to represent the USA in the Freestyle Kayaking World Cup. We also take a trip every year to far and away places with our HUCK program for our most advanced paddling campers which I will talk more in-depth about later in the summer, however to give you an insight on this year’s trip we are flying in to the Canadian Wilderness close to the arctic circle on float planes with kayaks strapped to the side, landing on a lake and paddling out of the gorge for a week on the mighty Magpie River. This is a true wilderness expedition that has taken quite a bit of preparation to make this trip possible. Let me talk you through a couple of campers who have just focused so well at paddling this summer and I wanted to acknowledge while I have the time. Three of our advanced kids (Holden, Graham and Billy) have been practicing their rolls daily and working towards getting on our bigger more advanced trips. I am not sure if they have spent a normal activity day at camp yet, so many trips to choose from. Eddie was the first to go through the entire canoe program, get in a kayak and learn to roll which is very exciting. Wills, Ward and Mac also are not far behind completing the progression, a big congratulations to them all. Some of these boys are just so small and seeing them on the water bounce down and nail their paddling lines is great to watch. Personally seeing these kids achieve their personal goals and gaining their Yacklet is just so rewarding, a smiling face and hearing the cheers by everyone watching just adds to their success story. With three trips full of kids going out every day there are just way to many stories to tell here, I wish I had the time to mention them all, so many great stories of achievement and success that I know every parent would love to hear. I hope you are enjoying your day today, I guarantee you that the campers on the trips today will be soaking on the warm waters and the wild rapids. I know that I will also be soaking in the day and enjoying every moment helping these kids gain a skill that has changed my life and hopefully paddling will be such a positive influence on these kids and change their lives also.